I’ve been really enjoying looking at the tracklogs captured by my GPS. It allows me to look at some interesting data about both my riding and the terrain. One common element in many of my rides is Bunker Hill Road. Have a look at it, as seen in Google Earth. As you can see, it winds its way up the mountain. 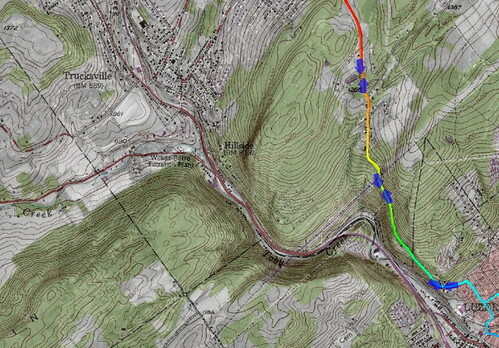 Note: partway between Bunker Hill Road (in blue) and 309 (in yellow), you can see a greyish line. 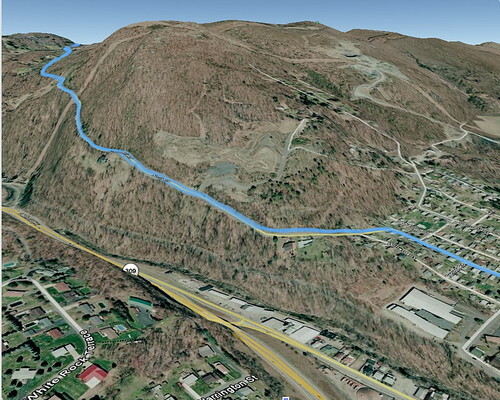 That’s the Back Mountain Trail, another way I often ride. I’m constantly amazed at the level of detail you can see in Google Earth. Not as flashy, but at least as useful, if not moreso, is TopoFusion. Here’s a topographic view of roughly the same area. It struck me during my ride that it takes an awfully long time to get up the mountain, but a much shorter time period to get down. I didn’t think to time it, but by looking at the GPS data in TopoFusion, I can get the information I want. 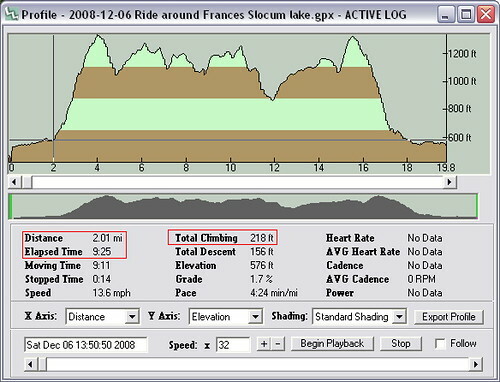 The crosshairs on the lower left of the profile are pointed at the start of the climb. All data is as of that point. As you can see, the climb lasted from 9:25 to 31:07, or 21:42 spent on this climb. Climbing-wise, at the beginning of the hill I had already climbed 218 feet. By the time I reached the top, I had climbed 1,000 feet, so the climb was 782 feet. As I look at the descent in the same manner, I see that it took merely 6:48 to get down the mountain. 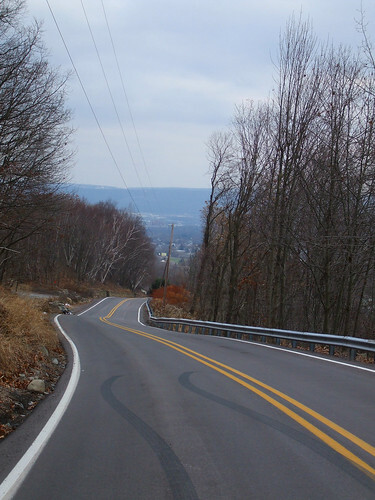 This time, I “only” hit about 30 mph on the descent, but it was too cold to handle going any faster. Tears were streaming from my eyes and obscuring my vision. And with the twists and turns, 30 is plenty fast anyway.